New Jersey actor Zachary Israel Braff parlayed his success as the star of the NBC series Scrubs into his first feature film, Garden State, in 2004. The novice filmmaker wrote, directed, and starred in the quirky coming-of-age tale filmed on location near many of the same New Jersey haunts he frequented in his teens. "Studios, financiers, production companies, they all passed on it," Braff told New York Times writer Lola Ogunnaike about his struggle to see his project to fruition. "They kept saying that the film was 'execution dependent,' which is just fancy lingo for 'We'll believe it when we see it.'" 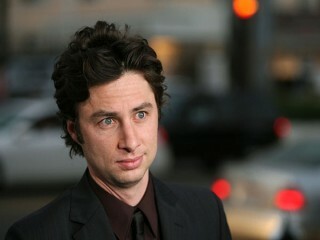 Zach Braff, but acted on the side in community theater productions. Anne, his mother, was a therapist, and Braff was the last of their four children, but he gained several stepsiblings after his parents' divorce and subsequent remarriages. A creative child, Braff play-acted at home in elaborate shows with the help of a makeshift theater he set up in the attic. He went to acting camp in the Catskill Mountains one summer when he was eleven, and the experience at Stage Door Manor was a formative one, he told Ogunnaike in the New York Times interview. "Because I was in the public school system and had no interest in sports, I always felt really alienated," he explained. "Here was this amazing other world where the cool thing was to be an actor and not a lacrosse player. It was the first time in my life that I felt like I belonged somewhere." At the camp, Braff and his performances were singled out by a talent manager, who encouraged his parents to let him begin auditioning. He tried out for countless parts, but failed to land anything until three years passed-and that was a pilot for a television series that never aired. It starred a young actress named Gwyneth Paltrow, who was also the producer's daughter. Braff had other brushes with future fame during his teens: he lived near siblings Andrew Shue ( Melrose Place ) and Elizabeth Shue ( Leaving Las Vegas ), and attended the same high school, Maplewood's Columbia High, as Lauryn Hill of the rap/R&B group the Fugees. Braff's sole credit as a teen actor was in one episode of The Baby-Sitters' Club when he was 15. At Columbia High, Braff did not appear in any stage productions, but did serve as a director for its television studio. He proved so skilled at it that he won the school's Excellence in Directing award twice-the only student in Columbia history to do so. When he graduated in 1993, he headed to the Chicago area to enroll at Northwestern University, where he studied film. His first minor break came at just before that, however, when he made his movie debut in Manhattan Murder Mystery, the 1993 Woody Allen-Diane Keaton comedy. Braff played their son, and years later told Stephanie Snipes in an interview that appeared on CNN.com about his experience. "I was so wide-eyed and terrified. I would love another shot at it," he enthused. "I was only in one scene but it was in a scene with Woody Allen, Diane Keaton, and Anjelica Houston . When I play it back now I look like I'm a deer in headlights." While still at Northwestern, Braff appeared in one other role, a made-for-TV movie called My Summer As a Girl that aired in 1994. During his summers off, he returned to the New Jersey-New York area and worked in video production, which he continued for a time after graduating with his film degree in 1997. In 1998, he landed an impressive role in a New York Public Theater production of Macbeth that was directed by George C. Wolfe of Bring in 'Da Noise, Bring in 'Da Funk fame, but the scarcity of work forced him to try his luck on the West Coast. He moved to Los Angeles, California, in 2000, and found a job waiting tables in a French Vietnamese restaurant. That same year, three small indie films in which Braff had appeared were released: Blue Moon, Endsville, and The Broken Hearts Club. The last film, in which he played a wild club kid among a close-knit group of gay men, won him some good reviews. "People would come to the restaurant after seeing the movie and say, 'We just saw your movie,'" he recalled in an interview with San Francisco Chronicle journalist Carla Meyer. "I'd be like, 'Thanks, yeah, let me tell you about our specials.'" Braff finally landed a plum role on a new network series, Scrubs, which debuted on NBC's fall 2001 line-up. His turn as medical intern as John "J.D." Dorian won great reviews, and the show quickly emerged as a standout. Braff's portrayal of the inexperienced, accident-prone future doctor quickly gained a cult following, and series creator Bill Lawrence told one journalist that the part was not that much of a stretch for the novice actor. "His situation in real life is close to his character's," Lawrence asserted to Entertainment Weekly television critic Bruce Fretts. "Every day at work, Zach's in way over his head. His inexperience has really worked for us." Though Scrubs finished in 38th place in ratings by the end of its first season, NBC executives recognized its promise and moved the show from Tuesdays to Thursdays. Braff, meanwhile, spent his spare time trying to interest someone in his first screenplay. He had written it just before starting Scrubs, but after he had impetuously quit the restaurant job. "I found out we weren't going to be starting Scrubs for four months, and I sort of panicked," he told Scott Brown in an Entertainment Weekly interview. "I didn't have any money, and I was scared I'd quit too early. But then I figured it was a sign to stop procrastinating and really sit down and write the script." Braff's script centered on a mostly out-of-work Los Angeles actor named Andrew "Large" Largeman, who returns to his New Jersey home for his mother's funeral. He has been overly medicated by his psychiatrist father, but does not bring the Lithium and other mood-stabilizing pills with him. The plot meanders through the funeral, his various encounters with old high school buddies, and a surprise romance with someone who may be as equally troubled as himself. But Braff did not have much luck in drumming up interest in the project, which became Garden State. "Almost everyone had passed on it," he told Joel Stein, a writer for Time. "They all said, 'Make it a three-act structure movie.' If I submitted it to a screenwriting class, I would have failed." Finally actor Danny DeVito's production company, aptly named Jersey Films, showed some interest. Braff managed to strike a deal in which he would both direct the film and star in it, though his sole reel was a 25-minute film he made while at Northwestern. Braff was fortunate to find a financial backer in the person of a onetime mortgage banker who had earned a small fortune in the past few years and was interested in moving into the entertainment industry. The novice film producer allowed Braff to direct it, as long as he promised to keep it cheap. He wanted the lead, he told Snipes in the CNN.com interview, because "a part like this, if I didn't write it, I never would have gotten a chance to even audition for this . So, I felt like I wanted to give myself a break in the movie world." Despite its projected low budget, Garden State managed to lure an impressive roster of talent: Natalie Portman as Large's love interest, Ian Holm as his chilly dad, as well as Peter Sarsgaard, Jean Smart, and Method Man. Even Wolfe, Braff's Macbeth director, had a cameo in it. Braff shot it on location back in New Jersey-though there were suggestions that Canada might be cheaper, he was adamant that it authentically reflect the "Garden State"-and when it premiered at the Sundance Film Festival in January of 2004, it was an audience favorite and incited a small bidding war. Both Miramax and Fox Searchlight bought it, and split the domestic and international distribution rights. Critics gave Garden State mostly positive reviews. Critiquing it for Salon.com, Stephanie Zacharek noted that the television heartthrob-turned-filmmaker's ambitions in making the film were evident. "But Braff never comes off as a blowhard-not even a fashionably self-effacing blowhard. His motivation feels genuine, as if he wanted to make a movie because he actually had something to say, instead of just wanting to smear his name around as a career move." Like a few other critics, Zacharek faulted the script for a resolution that seemed forced, but conceded that "Braff does capture the sense of coming home to a place you once loved, and realizing, in spite of any lingering fondness you may have for it, that it's no longer the place for you." Entertainment Weekly 's Lisa Schwarzbaum noted the significance of its title, which is also the official nickname of New Jersey. "But there's something of the Edenic, lowercase meaning that the writer-director-star is after, too, something gummy that gets at nostalgia for the garden state of childhood-however less-than-perfect that childhood actually was." Braff had little trouble lining up his next jobs after the success of Garden State. He was still charming audiences with the Scrubs role, and was serving as the voice of Chicken Little in the animated feature film of the same name, set for a 2005 release. With his brother, Adam, he co-wrote a screenplay based on a children's book from the 1960s, which they had loved as kids, called Andrew Henry's Meadow, and Braff would both direct and serve as executive producer of the treehouse-utopia fantasy. The film was scheduled for a 2006 release. Braff's debut film earned comparisons to The Graduate, the acclaimed coming-of-age tale that starred a young Dustin Hoffman. He dismissed such accolades with his characteristic dry wit. "It's flattering," he admitted to Brown in the Entertainment Weekly interview. "But I don't want to disappoint people. It's not that good." He did realize, however, that Garden State resonated with audiences and critics alike, and reflected in the New York Times interview that perhaps it was because the themes were more or less universal for many filmgoers. It was certainly his own story before TV stardom arrived, he told Ogunnaike. "That's where I was, lost and depressed and thinking: 'What's going to be the next chapter of my life? Because I need it to start now.' I felt a lot of people in their twenties could relate to that feeling, praying for an epiphany, praying for some clarity, something that would come along and open their eyes."